Rev. Charlie Harrison joined the staff at Tyner UMC as the Senior Pastor on June 19, 2011. 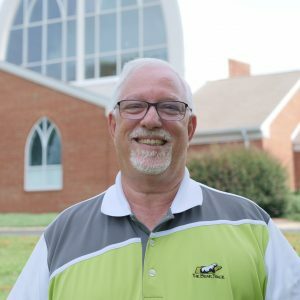 Pastor Charlie is in his eighth year of serving Tyner and his 43rd year of ministry as a pastor. He and his wife, Lou, have been married for 42 years and have three children: Katy (+ Wes) Lawrence, Charles C. (+ Marissa) Harrison, Jr., and David (+ Michelle) Harrison. Charlie and Lou have three grandchildren: Lucy Mackenzie, Olivia Lawrence, and Conor Luke Harrison. Charlie and Lou met at church in a youth group event many years ago. The rest is history (and it is a fascinating story if you have the chance to ask Lou how Charlie proposed). Since then, they have lived all over the Holston Conference as Charlie served at various churches. Charlie graduated with a B.A. from Tennessee Wesleyan College in 1979 and graduated with a Masters of Divinity from Candler School of Theology at Emory University in 1982. Pastor Charlie identifies the start of his faith as beginning in 1974. His faith has been strengthened by trusting more in God and seeing God through others. He is so confident in God’s call on his life that he cannot even picture himself doing anything other than ministering.